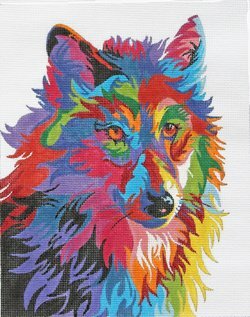 This multi colored German Shepherd needlepoint design from Julie Mar is a perfect stash buster. The design area measures 10" x 8" on 13 mesh mono needlepoint canvas. If you require stretcher bars we recommend a pair of 14" and a pair of 12" bars and some thumb tacks. You can buy this JulieMar German Shepherd needlepoint design as canvas-only or as a needlepoint "kit" with cotton, wool, or silk threads. For cotton we use DMC stranded floss; for wool and silk we use Planet Earth fibers which are single stranded and easy to use. This canvas is also ideal to use up your stash and one of our Stash Busters. Please contact us with any questions. We are always happy to help. You can email us or call us on 877 722 8463.